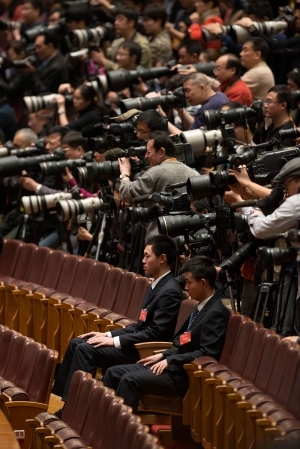 Journalists and a pair of security guards during a session of the 2013 National People’s Congress. Of course, this is all pure fantasy. The jumbotron message was no more than a propaganda fizzle at the center of a media-saturated universe China’s leaders seem chronically incapable of understanding. Unable to read Chinese, most Times Square onlookers would not have known this had anything to do with China. The logos of state-run Chinese media, arrayed across the bottom of the screen, would have been equally obscure. But the fantasy nevertheless reveals a great deal of truth about how the Chinese Communist Party continues to understand the role of journalists and the media today. Fifteen years after Journalists’ Day was created in 2000 as one of three professional holidays in China, the country’s leaders still refuse the media’s right to exist as a true profession, rather than as a proxy of Party-state power. The message here is that China’s media must serve a larger narrative of the country’s success under the leadership of the C.C.P. Moreover, it is the success of this narrative — in “attracting the attention of global media,” for example — that decides whether news coverage is “objective” or “impartial.” To be objective is to see the big picture of China’s success without being distracted by those niggling facts that might darken or discolor the portrait. 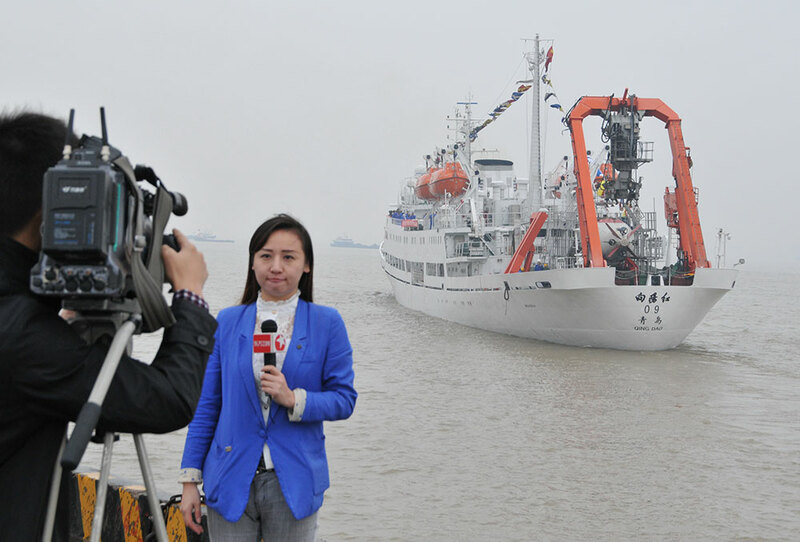 A journalist prepares to report on China’s manned submersible, Jiaolong, with its carrier, Xiangyanghong 09, as they set sail from Jiangyin City, Jiangsu province, November 25, 2014. He emphasized that [those on] the news frontline must deeply study, publicize, and implement the spirit of the Party’s Fifth Plenum, concentrate on the “13th Five-Year Plan” . . . stirring up positive energy, in order to provide public opinion support and a favorable public opinion environment for the full realization of a moderately prosperous society. Enhancing their sense of [public opinion] channeling, upholding correct guidance of public opinion, and raising their ability to channel [public opinion], consolidating and expanding positive and healthy mainstream opinion. Consider that one of the award-winning pieces of journalism from the event over which Liu Yunshan presided this weekend was this fawning series of reports from Xinhua News Agency, “Raising Even Higher the Great Banner of Reform and Opening Up,” which marked the 110th anniversary of Deng Xiaoping’s birth and further shored up the reform credentials of President Xi Jinping. Click into the multimedia piece and it begins with soaring music and images of Deng and Xi against a rich, chocolaty background that resolves at the top into the ceiling of the Great Hall of the People. If this is the standard for professional journalism, where do journalists go from here? How much higher can they raise the banner? In a string of cases in recent months, Chinese authorities have made the case for stronger press controls, citing poor ethics in the journalism profession. But it is the hypocrisy of pro-Party ethics in a highly commercialized media environment that is the root cause of poor — and by all accounts, worsening — ethics in Chinese media. While the Party leadership upholds falsehood, in the form of “guidance” and propaganda, as the ultimate professional standard, media operate under a competing market imperative that says they must attract audiences and deliver them to advertisers. Between the mechanisms of power and profit, there are no truly mediating professional standards or organizations. The message: we can all profit from falsehood. Reporters, editors, or publishers who envision themselves as professionals working in the public interest are out on their own. And if they try to form a professional community or act in concert over professional ideals, they run extreme political risks. Is this really about ethics? Article 1: In order to fulfill socialist core values; pursue professional ideals; strengthen the building of professional morals; [promote] compliance with the Constitution, laws, and regulations; and advocate a healthy industry climate, mass organizations in news, publishing, radio, film, and television jointly formulate and sign the following convention. Clause 1: Preserving the leadership of the Chinese Communist Party and the national interest, not publishing or spreading any language that damages the image of the Party or the nation. And there you have it. Clause 1 makes it clear from the outset, yet again, that professionalism equals political obedience.